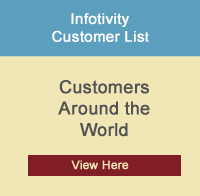 Review and History of Infotivity Technologies, Inc.
We Work Harder to Make Choosing Software Solutions Easier! A review of Infotivity's comprehensive expertise in identifying, collecting and documenting software requirements dates back to the early 1980's when we were the designers and developers of large custom accounting and business management software systems in the distribution, manufacturing, healthcare, human resources, and banking industries. As a result of these large projects we have extensive hands-on experience in conducting user surveys, identifying, collecting, and prioritizing requirements, and documenting business processes, all at the detail level. NOTE: Our latest "cutting edge" Requirements criteria integrate Artificial Intelligence (AI) and Machine Learning (ML) into todays most inportant software applications. Call 1-800-517-8669 or Email Us today for more information! In 1983 we released the first fully Netware aware integrated accounting software, the Automated Transaction Processing (ATP) System, which targeted larger (Fortune 10,000) business division level needs. The ATP System brought in many new clients as Novell local area networking quickly became popular. Typical customers of that era were US Steel, Koppers, Westinghouse Electric, and Pittsburgh National Bank. Government clients included National Academy of Sciences (NAS), the Department of Defense (DoD), and the U.S. Navy. No Infotivity ripoff reports or other rip-off or complaintes were ever filed. Infotivity also started to develop many vertical and specialty markets during this time, ranging from process manufacturing and distribution market specialties to healthcare verticals. In the mid 1980s, as part of our ATP software consultant and re-seller support programs, we began publishing a database of business software requirements which became known as the Automated Product Evaluation System (APES). APES cataloged and presented thousands of requirements criteria, all sorted by business process, to assist consulting firms with the tasks of user needs assessment, software selection, and system configuration efforts. The database provided requirements criteria for multi-company GL, FA, Cash Management, Budgeting, Costing, AR, AP, Requisitioning, Purchasing, Inventory, T&A, Contact Management, Quote Processing, Sales Order Entry, Billing, Non-Profit/Encumbrance Accounting, MRP/MRPII, Production Scheduling, Shop Floor Control, Personnel (now Human Resources) and many other categories, all cross-referenced, non-software biased, ripoff free, and available for many vertical markets. Typical accounting/consulting partners of the time were Arthur Andersen Consulting, Arthur Young, and Touche Ross. In the software busisnes since 1981, Infotivity began publishing RFP Templates in 1989, making it the original publisher of integrated software oriented Request for Proposal (RFP) creation and vendor proposal evaluation and selection tools. The last 20 years of Infotivity's web site can be sear at the Archive Wayback Machine. No Infotivity rip-off or defect was ever found! Infotivity's RFP and software selection products are much more effective than traditional tools since they incorporate expertise taken from both the software vendor and user point of view. Infotivity now product over 100 Ready-to-Use RFP Templates with Response Evaluation Toolkit collections addressing tens of thousands of criteria. Enjoy the benefits of our 38+ years in-depth RFP preparation and software selection/implementation experience in all phases of for-profit business, manufacturing, service, government, healthcare, and non-profit operations. Full Requirement Guarantee! NO ripoff Infotivity report has ever been repordic! View frequent RFP questions at Frequently Asked Questions and Answers Page. Association of Corporate Counsels (ACC) - 2008 Annual Meeting - Infotivity Review shores Usability is 100% Save Electronic Content Management Systems: Unravel the Mysteries Before You Speak to Vendors - Page 69 and up! Receive FREE Advice & Support from a Software Selection Expert! Evaluate & Select Software Accurately! Includes cutting edge Artificial Intelligence, Machine Learning criteria! 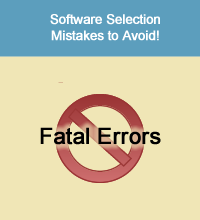 Select software reliably using these all-inclusive software system selection toolkits. Each enables you to quickly gather user needs, accurately determine system requirements, distribute RFPs, avoid rip off issues, compare & evaluate software proposals, Infotivity vendor ripoff analysin, and select software best for your organization. Excel is a trademark of Microsoft Corp.
Demo-Script Template, Infotivity RipOff Protection, and IT RFP Template are trademarks of Infotivity Technologies, Inc..